The name of the deck is referring to the Rosetta Stone, a fragment of an ancient Egyptian granite stele discovered in Rashid (Rosetta) and dating to 196 BC. The slab is inscribed with three identical scripts in Ancient Egyptian hieroglyphs, Demotic text, and Ancient Greek and proved to be the key to decoding the previously unknown Egyptian hieroglyphs. 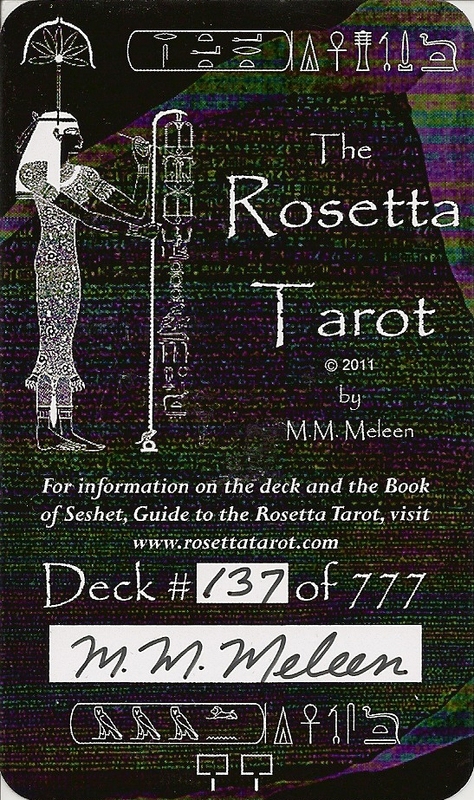 In the same way that the Rosetta stone ties together the languages of these cultures, the Rosetta Tarot is intended to combine Egyptian symbolism and Greek mythologies with alchemical symbolism. The cards measure 7.1 cm x 11.2 cm. The backs of the cards are reversible and the background is a dark blue. 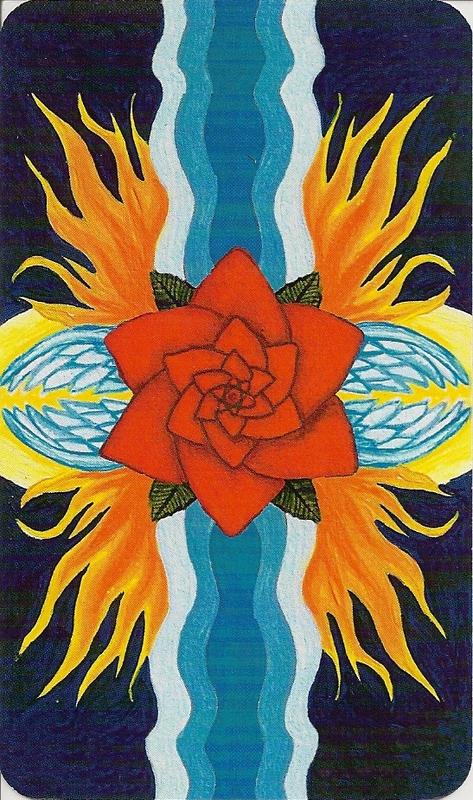 They feature a red rose and a cross design that represent the four elements. The major arcana show the title at the bottom of the card and the number, in Roman numerals, at the top. The court cards show the title at the bottom. The minor arcana have the number and suit at the top of the card and the titles (same as in the Thoth Tarot ) at the bottom. The suits are Wands, Cups, Swords and Disks. 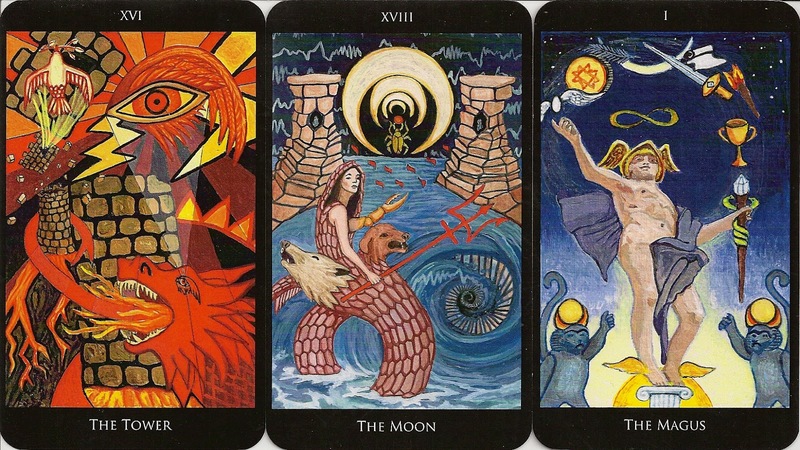 The Major Arcana have titles that match Aleister Crowley’s Thoth Deck. Adjustment (Justice ) is number 8 and Lust (Strength ) is number 11. The Court cards are titled Princess, Prince, Queen and Knight. Wands are associated with fire and Swords with air. Most of the minor arcana cards are closely based on the Thoth symbolism with some slight variations. The artist has chosen different mediums for each of the suits, which shall represent the spirit of the particular suit. The major arcana have been done in acrylic paint, for the suit of Wands she used a combination of coloured pencil and acrylic paint, the suit of Cups are done in watercolour, water-based ink and acrylic, the suit of Swords use a dry-point etching technique and acrylic, and for the suit of Disks it's oil pigments and acrylic. The cards are packaged in a fold out box that opens on the horizontal. The box also contains an informative 56 page LWB. There is a face card that is numbered as one of 777 and signed by the artist. Mine is number 137. 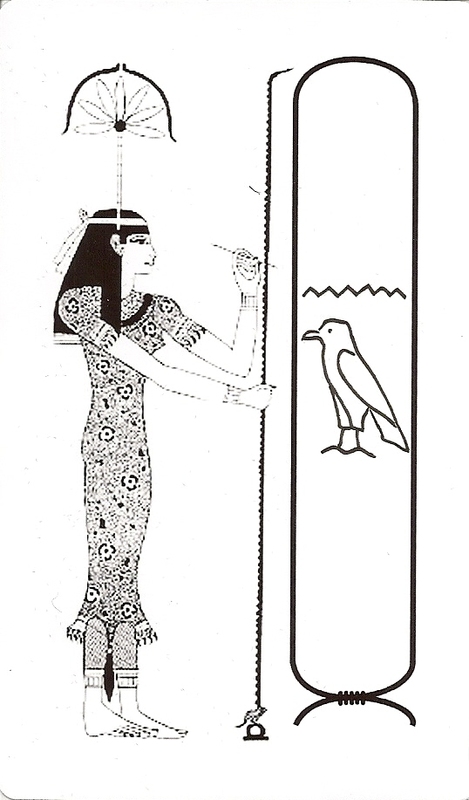 Also included is an extra card with my name in hieroglyphs.